Product description:"Stop your itchin’! This amazing formula effectively relieves skin irritations caused by insect bites and dry skin. It contains no harsh chemicals, coal tar or drugs such as cortisteroids. • Oatmeal and Aloe Vera: Work together to soothe the skin. • Tea Tree Oil: Helps purify, fortify and moisturize hair follicles. • Wheat Protein, Vitamins and Chamomile Extract: Nourish the skin and leave the coat silky and conditioned. 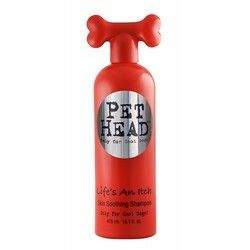 All Pet Head formulas are pH adjusted and free of paraben, petroleum derivatives, sulfate and DEA. "